More than 50 billion pieces of content are shared from third-party apps to Facebook every year. That's a massive opportunity to drive engagement for both the social network and developers, by getting users to spend more time in applications that connect with Facebook and on the service itself. 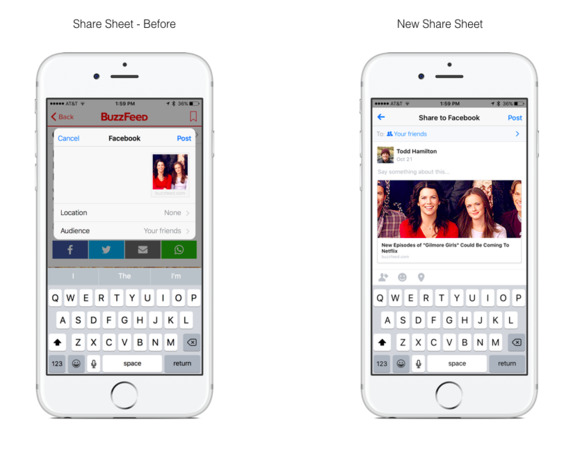 To that end, the company announced a new sharing experience for iOS users on Wednesday that is supposed to make it clearer to users what they're sharing to the social network, and how that will look when displayed on the News Feed. According to Alyssa Levitz, a product manager at Facebook, the changes were made to respond to user feedback. In particular, people complained that there wasn't a clean experience across apps, they wanted a preview of what the content would look like when they shared it, they wanted to share without logging into a third-party application using Facebook and they wanted to be able to easily control who they were sharing with. The new extension, which was built using tools that Apple added to its mobile operating system last year, is designed to address that. It pops up a large window over the content that users want to share that allows them to add a comment to whatever they're sending off to the social network, and choose who they want to share it with. Developers that already have their application built to use the native Facebook sharing extension won't have to do anything differently -- their apps will start using the new experience automatically. In addition to providing tools like this to developers, Facebook is also directly helping startups get moving with its FbStart initiative. The program provides qualified companies with access to a community of other startups, events hosted by Facebook and tools provided by partners. Liu said that more than 7,200 startups are participating in FbStart, and a partner ecosystem of more than 30 organizations. On Wednesday, FbStart added seven new partners, including Dropbox, Twilio and Coursera. Developers who want to learn more about what the company is doing can attend its F8 conference in San Francisco next year from April 12-13. This story has been updated to correct the link in paragraph two.